Figure 1: These images illustrate the steps in recreating a human face using 3D scanning (top row) and a skin BSSRDF (bottom row). This sketch describes the process and the technology used in the creation of a digital clone of a human face for a story in the November 2002 issue of National Geographic on skin [Swerdlow 2002]. In the Spring of 2002 National Geographic contacted me to hear if I would be interested in rendering a human face for a story on skin. The challenge would be to reproduce the appearance of a face given a 3D model. Scanning: The first challenge was the acquisition of an accurate 3D model of a face. Since the face would be rendered as a close-up spread over two pages the face model had to be very accurate, with enough resolution to capture fine details such as pores. 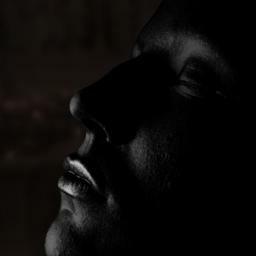 Unfortunately, it is not possible with existing techniques to scan skin with this accuracy due to subsurface scattering which blurs the light as it interacts with the skin. To achieve sufficient accuracy a company (Arius3D) has developed a technique where they create a cast of a human face. The cast is flexible enough to represent pores and sufficiently opaque that it can be scanned with very high resolution (0.1mm). With this technology, they were able to produce a face model with 13 million triangles. A slightly simplified version is shown in Figure 1a - the smallest triangles in this image are representative for the detail in the full model. In addition, photographs of the model were aligned with the 3D model to obtain a rough estimate of the skin color (Figure 1b). A white diffuse rendering of the geometry is shown in Figure1c. Rendering: To accurately render a human face it is necessary to take into account the two key elements of light interaction with human skin: subsurface scattering and light reflection of the oily layer at the surface the skin. Since the scanned model did not have any information about oil, the first task was to create a program that made it possible to interactively adjust the oil layer density over the face. A rendering of the final oily layer (using a Torrance Sparrow model) is shown in Figure 1d. 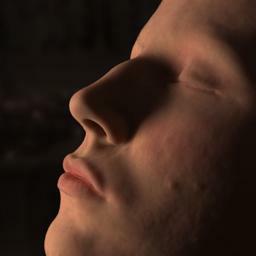 A full simulation of subsurface scattering requires a BSSRDF model [Jensen2001] as well as scattering and absorption parameters for the skin. These parameters were not available and instead the skin parameters measured in [Jensen2001] were used as a starting point. Furthermore, a simple heuristic was developed to locally adjust the scattering parameters slightly based on the color information from the scanning process. 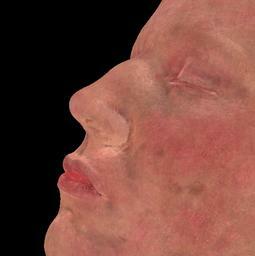 Using the BSSRDF model we obtained the image in Figure 1e, which shows the subsurface scattering component of the skin. To obtain the final face image it was necessary to add facial hair to the model. Most important was the lack of eyebrows. The eyebrows and eyelashes were modeled by Steve Worley using his commercial Sasquatch program (www.worley.com), and rendered using the Kajiya model for hair [Kajiya 89]]. Note, that the rendering of the final face model had to be done in roughly one week. 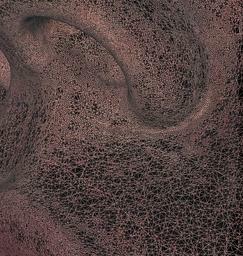 The final combined result is shown in Figure 1f, and this image appeared in the 2002 November issue of National Geographic [Swerdlow2002], and was used on the cover of the Dutch edition. For the same article, National Geographic had the human subject photographed under roughly the same lighting conditions as in the simulation in order to compare with the results of the computer generated skin. Unfortunately, the subject used a significant amount of makeup for these closeup photographs, which almost eliminated the presence of subsurface scattering in her skin. Future challenges includes a more detailed skin model as well as the ability to animate the face.